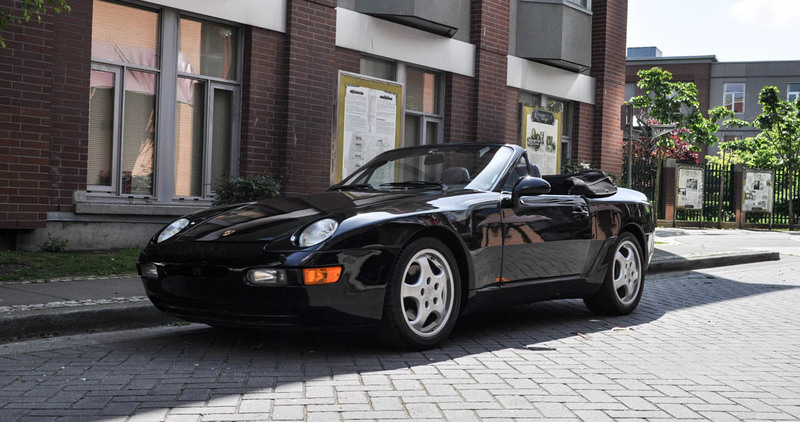 The Porsche 968 is equipped with some great modern features. That said, it still manages to preserve an unmistakably classic charm. This hand-built Cabriolet was one of the last transaxle Porsches ever built, and has recently begun to mature into a modern classic that’s worth keeping your eye on. Produced from 1992-1995, this particular 92’ example is one of 41 manual shift cars shipped to Canada in the early 90’s. As aircooled 911 prices catapult into the stratosphere, the 968 offers an affordable avenue into the classic Porsche experience. The 1992 968 features a state-of- the-art drivetrain: Its 3.0l, 240 hp four-cylinder engine is mated with a new Porsche designed 6 speed transaxle. The engine provides modern fuel economy (26 mpg/highway), while the 6-speed transaxle yields a usable flat torque curve starting at around 2500 rpm. The jewel in the 968’s crown however, is the debut of VarioCam; a technology which offers variable valve timing on both the intake and exhaust. At low rpm, this provides a torque boost unheard of at the time of its production, as well as providing massive power at high rpm. The 911 did not receive VarioCam until the release of the 1999 996 Turbo. The 968 is also equipped with modern 4-wheel vented disc brakes with ABS (lifted from the 944 turbo). Couple the disc brakes with the precise balance achieved by the transaxle layout, and you’ve got Porsche performance that could rival that of a modern sports car on a twisty backroad. The 968 provides the visceral analog driving experience that’s lost on modern vehicles. The heavy, communicative steering lightens at speed and translates the road surface directly to the driver’s fingertips. Unlike its predecessors (924/944) the 968 was hand-built in Zuffenhausen, alongside the 911 and 928. This means higher build quality and durability than older examples of the 4-cylinder Porsche (constructed by Audi in Neckarsulm, Germany). Lastly, the 968 offers a trip back in time with its seductive period design features: The vintage pop-up headlights (mirroring those of the 928) offer an unmistakable early 90’s feel on its exterior. The interior incorporates the spartan dash design wherein every necessary control is easily accessible to the driver. If you’re looking for an alternative to Porsche’s usual rear engine offerings, the 968 currently offers considerable appreciation potential. A modern powertrain with the perfect mix of old school analog driving thrills. Truly the best of both worlds.